The ecommerce giant next door, Alibaba, is all set to invest nearly $575 million in Noida based Paytm, an online payment platform owned by One97 Communications Ltd, valuing the latter at $1.9 billion. None of the two parties to the transaction have yet made any official announcement to the effect. The Alibaba spokesperson has not yet responded while the spokeswoman for One97 said, “We will communicate as and when we complete the process.” Though a formal announcement is expected to come towards the end of this month or probably in the first week of February, here is what we heard over the grapevine. However, Paytm Founder & CEO Vijay Shekhar Sharma’s twitter status update (See Below) hinted that this deal is in works (He did not deny anything, which points it is pretty much happening). ET has cited sources directly involved in the talks have told that Alibaba Group Holding Ltd together with its pay unit Alipay will soon have a 30-40% stake in Paytm. The parent company, One97, will issue fresh shares due to which the holdings of existing shareholders will be diluted significantly. Subsequently, Alibaba and Alipay will both put one member on the company’s board in addition to its two founder directors. The fresh funds thus obtained will be used in expanding Paytm services and make it one of the country’s leading online payment businesses soon. Launched in December 2010 by dynamic Vijay Shekhar Sharma, Paytm has evolved from a recharge portal to a utilities payment service to an online marketplace within a short span of four years. Other investors of One97 include SAIF Partners, Intel Capital and SAP Ventures, says their official website. Paytm has more than 20 million registered mobile wallet users, it said. Paytm operates an internet marketplace which Indian customers can access through their mobile phones. The company says it has more than 15,000 sellers and the times being offered range from electronics to fashion jewellery and furniture to shoes. Travel portal Expedia, Apartment rental site Airbnb and Uber are among their best known clients. Alibaba which mainly operates online marketplaces dominates online retail scene in the most populous country. It went public four months back in the United States and made the largest initial public offering in the world at $25 billion. The retailing giant which has been itching to expand its services beyond its own shores will thus get access to another huge market in addition to its own. 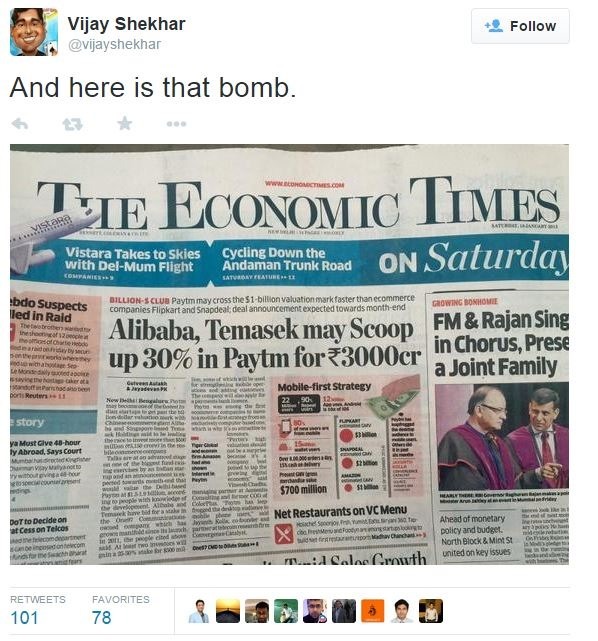 This will be Alibaba’s first investment in Indian e-commerce industry which is still in its embryonic stage. One of the biggest venture capitalists in the world, SoftBank Corp from Japan has also shown a lot of interest in the Indian online retail in the last few months. Snapdeal is one of its most loved Indian projects. The largest online retailer in the world, Amazon, also bets hugely on the future of ecommerce in India. The agreement between Paytm and Alibaba, which will need to be approved by the Chinese authorities, will enable Indian online buyers to shop from Alibaba while making payment through Paytm. At the same time, Chinese buyers will have access to the merchandise available over Paytm and can use Alipay to make purchases therefrom. Paytm will, as a result of this agreement, get access to Alipay’s payment technologies, including its payment gateway, mobile-wallet system and antifraud measures. Looks like a win-win situation for both! The mobile wallet industry in India which is only beginning to take off is expected to grow to three times its present size to Rs 1,210 crore within the next five years predicts the research firm RNCOS. “M-wallet has a high capacity as an alternative to traditional and current payment systems in India. Growth observed in m-commerce sector in India has moved its payment systems to mobile devices,” said the RNCOS report. Paytm was earlier said to be in talks with Singapore based Temasek Holdings as well. The founder-CEO is also rumoured to have met top executives from SoftBank in October 2014 in the same context. Infosys Awards Top Performers With iPhone 6. Are Indian Employers Getting Generous?